For a complete review on Negative Thermal Expansion click here [pdf] to view the Review on Negative Thermal Expansion compiled by the Malta group. Many materials which we encounter in everyday life expand on heating, which phenomenon may be explained by looking at interatomic distances. If we were to consider a crystal lattice close to absolute zero with individual atoms located next to each other in a regular pattern, the atoms would be vibrating to a relatively small extent, taking up a particular volume of space. As the temperature is increased, the atoms vibrate more and this corresponds to the material expanding as more volume is taken up by the vibrations. Although most materials exhibit Positive Thermal Expansion, there are, in fact, some materials which exhibit Negative Thermal Expansion (NTE) in some particular temperature range. When such materials experience an increase in temperature in their NTE range, they contract (i.e. shrink in size) with the result that their density increases. NTE, is generally considered to be rare, unusual and limited to certain types of structures. Nevertheless, it is important to note that NTE has been shown to take place in a very common material: water. In fact, liquid water exhibits an increase in density between when heated between 273K and 277K whilst the hexagonal form of ice has a NTE coefficient at 45K. Structures with a Negative Thermal Expansion proposed by the Malta Group. The metamaterials unit at the university of Malta has analysed the anisotropic thermal expansion properties of a two-dimensional structurally rigid construct made from rods of different materials connected together through hinges to form triangular units. In particular, it was shown that this system may be made to exhibit Negative Thermal Expansion coefficients along certain directions or thermal expansion coefficients that are even more positive than any of the component materials. The end product is a multifunctional system with tunable thermal properties that can be tailor-made for particular practical applications. 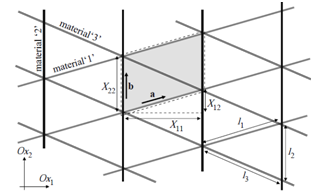 Figure 1: A two-dimensional lattice made of rods, intersecting at pin joints. The rods in each direction are made of a different material. The unit cell of the lattice is shown by the dashed parallelogram. It was also shown that such triangular systems may be made up from three beams, which are welded together. If the base of the triangular construct has different properties (thermal expansion) than those of the sides, the triangular system is capable of exhibiting Negative Thermal Expansion in one dimension when the base of the triangle has a larger thermal expansion than that of the sides. More interestingly, it was shown that the degree of linear thermal expansion is dependent on the relative stiffness (Young’s moduli) of the materials that make up the base and sides of the triangular construct. Figure 2:The Deformed shapes of a triangular system made up from beams having different CTE's and Young's moduli under temperature loading. Figure 3: (a) A cylindrical structure consisting of a needle-like inclusion of material B embedded in a matrix of material A and (b) a cross-section showing its dimensions. A construct in the form of a multi-layered system built from conventional materials having different mechanical and thermal properties was also proposed. This construct can exhibit pre-determined values of thermal expansion which could also be negative. 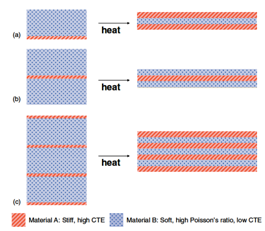 It is shown that for maximising Negative Thermal Expansion there should be a combination of thin layers of stiff materials having a high positive coefficient of thermal expansion bonded with thicker layers of a soft material having low CTE values and, more importantly, having Poisson's ratio as high as possible. (1) In the composites industry, where negative thermal expansion materials are used as components of composites to adjust the overall thermal expansion of composites to some particular value. (3) In the electronics area, there is a need for substrates and heat sinks that match the thermal expansion of Si. There are currently several active efforts in this area using ZrW2O8 to reduce thermal expansion.